With CEO Mary Barra at the wheel, GM has matured their climate strategy from simply greening operations to product strategy to shared electric mobility solutions. A few years ago, GM’s energy demands came from building cars. Now they come from running cars. And the company is being joined by some unlikely allies in the push for widespread electric vehicle adoption. 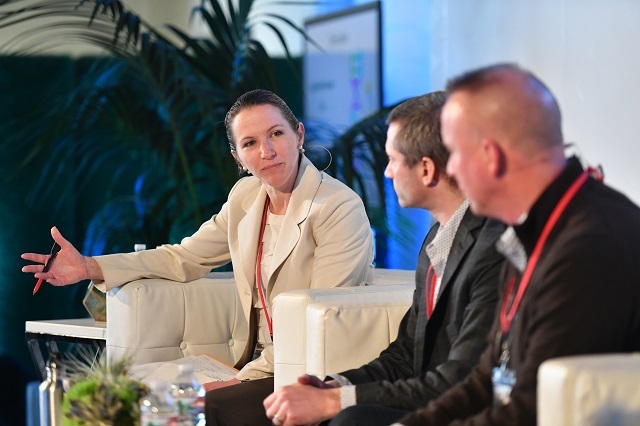 On April 19, I had the pleasure of presenting on a panel at Shell’s Powering Progress Together conference with Rob Threlkeld of GM and Brent Hollenbeck of TimberRock, a company that provides energy storage and electric vehicle (EV) logistics support. The two spoke about an innovative partnership that may presage the bringing together of two industries in the near future: car companies and energy utilities. Threlkeld started at GM 18 years ago, “back when we were switching out T12 to T8 bulbs…now it’s LED.” Engineering advances made it possible to do more with less, but no matter how good their engineers, at some point GM’s efficiency investments start to see diminishing returns which is when renewables kicked in. GM, alongside a number of high-tech companies, started setting renewables targets around 2010. In 2015, a good four years ahead of schedule, a power purchase agreement in Mexico propelled GM across the finish line of 125 megawatts by 2020. What seemed insurmountable in 2011 became attainable as the offsite renewables market matured and technology cost curves dropped precipitously. “At that point, it was just good business sense to join the Renewable Energy Buyers Alliance and commit to 100 percent renewables by 2050,” said Threlkeld. This goal inevitably led GM to the door of the utility companies they rely on, entreating them for options beyond renewable energy credits to source offsite renewables. Indeed, in March 2018, GM became one of the first companies in Michigan to leap on a new green energy rider tariff approved by the state. But CEO Mary Barra isn’t satisfied with greening GM’s operations, no matter how much money it puts back in her coffers. In 2016, she announced a new business line: car-sharing company Maven. With shared vehicles being ideal use cases for electrification, Maven was able to tap into GM’s long-standing strengths in generating their own clean power onsite. Offsite, GM started negotiating with utilities like Austin Power to bring green tariff options to their Maven customers. Enter Brent Hollenbeck of TimberRock. The company got its start by building better batteries and improving EV logistics for GM plants. But then they began experimenting at the nexus of renewable energy systems and electric vehicles to ensure loads were well balanced. As they began to progress and GM’s renewable ambitions expanded, these started to look less and less like experiments and more like future business. As we look around the bend a bit, this Batman and Robin team may help U.S. utilities solve one of their most disconcerting of challenges: flatlining loads. With electrification of vehicles, utilities have a new source of load and storage that may help assuage investors nervous about efficiency gains eating into their bottom lines. In fact, as my colleague Letha Tawney of WRI’s Clean Power Council explained to me a few weeks ago, utilities are so keen for that load they’re actively seeking ways to ensure EVs don’t suffer from a perception of being a luxury of the wealthy. The combination of electric vehicle manufacturer, occasional energy producer, and car-sharing service (GM) and the intermediary that makes it all work smoothly with the existing grid (TimberRock) might well just be a model for the future. Emma Stewart is the Urban Efficiency & Climate Director at WRI Ross Center for Sustainable Cities, where she is responsible for the Institute’s global work on urban building and vehicle efficiency, urban distributed renewables, and city climate strategy.